Obituary for Esther Struck | Langeland Family Funeral Homes, Inc.
Esther D. Struck, age 96 passed away peacefully at Bickford Cottage, Portage, MI, on February 22, 2018. She was born Esther Grace Daverman to Dutch immigrants, Cora and Herman Daverman, on March 25, 1921 in Grand Rapids, MI. 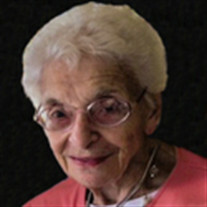 Esther graduated from Creston High School, Grand Rapids, and was a 1942 graduate of Calvin College, where she majored in education. At Calvin she met her beloved husband, William "Bill" Struck. They married in 1943 and subsequently moved to Kalamazoo, MI were they lived for over 72 years. Bill passed away in 2014. Esther taught third grade briefly before marrying Bill, at which time she became a full-time homemaker and mother to their eventual three children. During their long life in Kalamazoo, Esther was involved in a number of church and community organizations. She was a member of Second Reformed Church, where she faithfully sang in the choir and was a member of several Women's Circles. She served as a den mother with the Boy Scouts and room mother to her children's elementary school classrooms. When her children were grown she served on the Community Mental Health Board and pursued several academic interests, taking classes at Western Michigan University. She was a member of both the Kalamazoo Institute of Arts League and the Kalamazoo Symphony Orchestra League, often volunteering at their fundraising events. She was also a member of the American Association of University Women (AAUW), and her long-time book club. Esther was blessed with many artistic talents including painting and photography, as well as making her home inviting and comfortable for family and friends. She enjoyed and excelled in decorating, sewing, antiquing, gardening, floral arranging, cooking, baking, and entertaining. She taught her family to discover beauty in our everyday surroundings. Her photographs will be cherished for her keen eye on Mother Nature. Whether at the family cottage on Lake Michigan, or their home in Kalamazoo, guests and family were always graciously welcomed by Esther. Her love, goodness, and listening ear will be forever missed by family and friends. Her family is eternally grateful for so many years of memories and her devotion as mother, grandmother and great grandmother. Esther was preceded in death by husband William A. Struck; brothers Robert and Edward Daverman, and sister Marian (Daverman) Smedes. She is survived by son Stephen (Susan) Struck of Grand Haven, MI; daughter Nancy Struck of Portage, MI; daughter Barbara (Jay) Rothmeier of Wayzata, MN; grandchildren Emily (Patrick Dillon) Struck of Rockville, MD; Andrew (Ellen) Struck of Austin, TX; Samuel Watt of Kalamazoo; Peter Rothmeier of Minneapolis, MN; and Angela Rothmeier of Wayzata, MN; and great grandchildren Sophie, Carson, and Cecilia Struck, of Austin, TX. Special thanks to the staff at the memory care unit at Bickford Cottage for Esther's care during her last months, and especially to Dennette Shettner for her caring companionship in recent years. A memorial service will be held on June 23, 2018 at 1:00 PM at Second Reformed Church, 2323 Stadium Drive, Kalamazoo, MI. Interment will be private, and arrangements are being made by Langland Family Funeral Homes. Visit www.langelands.com to sign Esther's online guestbook or share a memory with her family. In lieu of flowers the family suggests contributions in Esther's name be made to the Kalamazoo Institute of Arts League or the Kalamazoo Symphony Orchestra League.